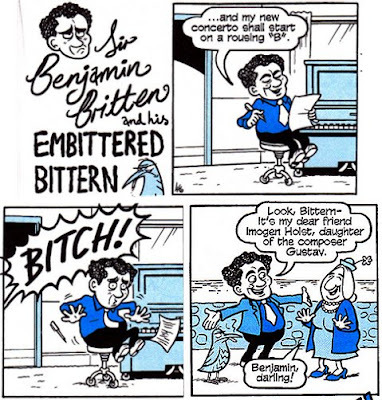 A reader reports that Benjamin Britten and Imogen Holst make a surprise appearance in the adult humour comic Viz. Copyright, not to mention good taste, prevents me from reproducing the whole comic strip, but the heavily edited samples above gives the general idea. Imo and Ben appear together in rather more congenial surroundings here.